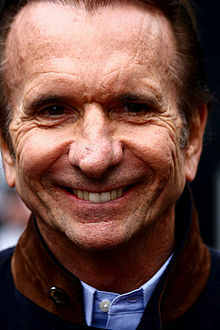 Emerson Fittipaldi (Portuguese pronunciation: [ˈɛmeɾson fitʃiˈpawdʒi]; born 12 December 1946) is a semi-retired Brazilian automobile racing driver who won both the Formula One World Championship and the Indianapolis 500 twice each and the CART championship once. Since his retirement from Indy Car racing in 1996, Fittipaldi races only occasionally. In 2008, he was one of only three people in history to have a Corvette production car named in his honor. At age 67, he entered the 2014 6 Hours of São Paulo. Emerson Fittipaldi was born in São Paulo, Brazil. He is the younger son of prominent Italian-Brazilian motorsports journalist and radio commentator Wilson Fittipaldi Sr and his wife Józefa "Juzy" Wojciechowska, an immigrant from Saint Petersburg of Polish and Russian descent. His grandfather, Ivan Wojciechowski, was an officer in the Tsarist army. He was named after American author and philosopher, Ralph Waldo Emerson. Both his parents had raced production cars shortly after the Second World War and Wilson Sr was also responsible for the first Mil Milhas race in 1956, in São Paulo, having been inspired by the 1949 Italian Mille Miglia. Emerson, along with his brother Wilson, became motorsports enthusiasts as young children. Fittipaldi is the younger brother of former Formula One driver and team owner Wilson Fittipaldi. He is the uncle of TUDOR United Sports Car Championship driver Christian Fittipaldi. He was married to Maria Helena from 1970-82. They had three children. He was married a second time, to Teresa, in the mid-1980s. They have two children. His two grandchildren Pietro and Enzo Fittipaldi are also racing drivers, with Enzo being announced as a member of the Ferrari Driver Academy in December 2016. In his youth in Brazil, Emerson was known as 'Rato' - mouse, which contrasts with 'Tigrão' - big tiger - for his brother. In September 1997, while recovering from injuries in a crash at Michigan International Speedway a year earlier, he was flying his private plane across his orange tree farm in the state of São Paulo. The plane lost power and plunged 300 feet (91 m) to the ground, leaving him with serious back injuries. Though Fittipaldi had converted to Christianity the year prior, his beliefs were reinforced after the crash. He was a friend of Beatles guitarist George Harrison and was with him shortly before Harrison died in November 2001. In 2016, Fittipaldi established Fittipaldi Motors, and along with Pininfarina and HWA AG, created his first sports car project, the Fittipaldi EF7. Since the 2000s Fittipaldi has been a member of an Evangelical Baptist church. At age 14, Fittipaldi was racing motorcycles, and at 16, hydrofoils. While racing one day, his brother Wilson took off at 70 mph (110 km/h) and landed upside down. Afterwards, the brothers mutually agreed to no longer race hydrofoils and return to dry-land racing. The pair moved to racing Formula Vees, and built up a company with their parents. In his second season in single-seaters, Fittipaldi won the Brazilian Formula Vee title at age 21. He left for Europe in 1969, with the ambition to convince team owners of his talent in three months. After some podiums and his first victories in Formula Ford, Fittipaldi was first trained and then subsequently engaged by the Jim Russell Driving School Formula Three team. He won nine F3 races on the Jim Russell Lotus 59 in the MCD Lombard Championship to become the 1969 champion. For 1970, Fittipaldi moved up to F2 by joining the Lotus semi-works Team Bardahl campaigning Lotus 59B. With six finishes in the points and four on the podium, he ended the eight-race season in third place behind Clay Regazzoni and Derek Bell. While this result was very impressive for the newcomer to the series, the spotlight was on Fittipaldi that year because of his activities in Formula One instead. Based on the success of Cosworth DFV and Lotus 49/49B in 1968, Team Lotus was enjoying the reputation as one of the top F1 teams with the inflow of sponsorship money, and Colin Chapman used the third seat on the team for championship races as the testing ground for younger drivers. This was in contrast to the team's tradition to use non-championship F1 events for the purpose. The third seat was given to Alex Soler-Roig in the early 1970, and then to Fittipaldi starting with the British GP in July, with Jochen Rindt and John Miles as the regular seat holders. Fittipaldi scored a fourth place as the No. 3 driver at the next German GP where the No. 1 Jochen Rindt won, and the No. 2 John Miles retired. Team Lotus plans for the season drastically changed when Jochen Rindt was killed at Monza in September and became the only driver to win the championship posthumously. John Miles also left the team, and Fittipaldi was promoted to be the Lotus No. 1 driver on his fifth F1 race at the United States GP with Reine Wisell and Pete Lovely as the teammates. Fittipaldi proved up to the task and won this first post-Rindt race for Lotus. In his first full year as Lotus's lead driver in 1971, Fittipaldi finished sixth in the Drivers' Championship as the team further developed the previous season's Lotus 72. Armed with what was arguably the greatest Formula one design of all time, the Lotus 72D, Fittipaldi proved dominant in 1972 as he won five of 11 races and claimed the F1 Drivers' Championship. At 25 he was then the youngest champion in F1 history. It appeared he might do it again in 1973. But after three wins in four attempts with the 72D, he began to struggle in the new 72E that was unveiled mid-year. It resulted in the reverse of the previous year, with Stewart beating Fittipaldi for the Drivers' Championship. Fittipaldi left Lotus to sign with the promising McLaren team. Driving the highly efficient McLaren M23, he had three victories in 1974, reached the podium four other times, and beat out Clay Regazzoni in a close battle for his second championship. The following season, he notched two more victories and four other podiums, but was second to a dominant Niki Lauda. However, at the height of his F1 success, Fittipaldi shocked everyone by leaving McLaren to race for older brother Wilson Fittipaldi's Copersucar-sponsored Fittipaldi Automotive team. He remained with the team for five seasons but only managed a best finish of second. Fittipaldi decided to retire from racing at the end of 1980. He has since said that his last two years in Formula One were very unhappy: "I was too involved in the problems of trying to make the team work, and I neglected my marriage and my personal life", although at the time he cited the deaths of many of his colleagues as his reason. He was only 33, but had been racing in Formula One for a decade. He had failed to finish seven of the last ten races that year and had several times been outpaced by his Finnish teammate Keke Rosberg (a future champion himself). He moved into the management of the team alongside his brother. The team struggled on for another two years with minimal sponsorship, going into receivership at the end of 1982. After leaving F1 in 1980, Fittipaldi took time out from major racing for four years, returning in 1984 in CART. The 38-year-old spent his first season acclimatising to IndyCars, driving for two teams before joining Patrick Racing as an injury replacement. He stayed five years with the team, recording six victories and solid finishes in the overall standings. In 1989 he had five wins and finished in the top five in every race he completed, giving him a CART championship. Among his wins was a dominant performance in the 1989 Indianapolis 500 where he led 158 of 200 laps and won by two laps, but only after a dramatic duel with Al Unser, Jr. in the closing laps of the race. Unser ran down Fittipaldi after a late-race restart and passed him for the lead on lap 196. Three laps later, Fittipaldi used lapped traffic to his advantage to pull alongside Unser on the backstretch. Neither driver would give way, and the two cars touched wheels as they went through turn three side by side. Unser's car spun out of control to hit the outside wall, while Fittipaldi was able to maintain sufficient control to keep his car moving straight. In spite of the altercation, Unser saluted Fittipaldi from the infield as Fittipaldi passed by on the final lap. Roger Penske hired Fittipaldi for his racing team in 1990 and he continued to be among the top drivers in CART, winning at least one race with Penske for six straight years. In 1993 he added a second Indianapolis 500 victory by taking the lead from defending Formula One World Champion Nigel Mansell on lap 185 and holding it for the remainder. The race saw him break Indianapolis victory lane tradition when he drank a celebratory bottle of orange juice instead of the traditional bottle of milk. He was only the second driver to not drink milk at Indianapolis since the tradition was founded in 1936 (and firmly established in 1956). Fittipaldi owned several orange groves in his native Brazil, and wanted to promote the citrus industry. Fan reaction was negative to the break in tradition despite the fact that Fittipaldi chased the juice with milk. As a result of drinking the juice, Fittipaldi forfeited $5,000 from the winner's purse and publicly apologized to the American Dairy Association. Fan reaction to the milk snub was highly negative, and he was booed a week later at Milwaukee, a center of the American dairy industry. In the years that followed, many fans continued to hold the action against him. In interviews since, Fittipaldi explained his action, and apologised for the wave of negativity that followed. Fittipaldi returned to Indianapolis to drive the Chevrolet Corvette Pace Car for the 2008 Indianapolis 500. Despite the passage of 15 years, he was again booed and heckled by some fans during the parade laps. In May 1994, Fittipaldi skipped a practice session for the Indianapolis 500 after his close friend and fellow Brazilian world champion Ayrton Senna died during a Formula 1 crash. Fittipaldi was one of the pallbearers during Senna's funeral, alongside Jackie Stewart, Alain Prost and several other F1 world champions. Fittipaldi nearly won his third 500 but clipped the turn 4 wall with 15 laps to go while he was holding a nearly full lap lead over teammate Unser Jr. Approaching 50, he was still with Champ Car in 1996 when an injury at the Michigan International Speedway ended his career. Fittipaldi did not return to the series as a driver after the injury. Fittipaldi finished his Champ Car career with 22 wins. In 2003 he made a return to Champ Cars as a team owner. Fittipaldi was the acting team principal for the Brazilian A1 GP entry. In 2005 Fittipaldi made a surprise return to competitive racing in the Grand Prix Masters event held at Kyalami in South Africa, finishing second behind fellow F1 driver Nigel Mansell. In 2008, Emerson and his brother Wilson entered the Brazilian GT3 Championship, driving a Porsche 997 GT3 for the WB Motorsports team. In 2011, he started embracing social media and became a Chairman of Motorsport.com. In 2013 he began writing a regular monthly blog column on the official website of McLaren. He was inducted in the Motorsports Hall of Fame of America in 2001. Fittipaldi was inducted into the Indianapolis Motor Speedway Hall of Fame in 2004. Wikimedia Commons has media related to Emerson Fittipaldi. Mario Andretti, Nigel Mansell and Jacques Villeneuve - Other Formula One and CART champions. Jim Clark, Graham Hill, Mario Andretti, and Jacques Villeneuve - Other Formula One and Indianapolis 500 champions. Jody Scheckter and Michael Schumacher - Other Formula One champions with brothers racing in the series. ^ Comune di Trecchina. "Trecchina, un po' di storia". Retrieved 17 March 2016. ^ "История Эмерсона Фиттипальди, рассказанная им самим" (in Russian). Archived from the original on 15 March 2014. Retrieved 8 February 2016. ^ Ludvigsen (2002) p. 26; "Fittipaldi's paternal grandfather was Italian, and his maternal grandmother was Russian." ^ "Emerson Fittipaldi". Retrieved 7 February 2018. ^ "In Step with Emerson Fittipaldi". The Greenville News. 29 May 1994. Retrieved 7 February 2018. ^ "Emerson Fittipaldi oficializa união com Rossana Fanucchi em São Paulo". GloboEsporte. 8 December 2012. Retrieved 8 February 2016. ^ "Ferrari recruits Enzo Fittipaldi to young driver programme". Retrieved 23 December 2016. ^ "60 Seconds: Emerson Fittipaldi". metro.com.uk. 1 May 2008. Retrieved 7 February 2018. ^ "George Harrison in Brazil and Singing Tribute to Emerson Fittipaldi". Sounds and Colours. Retrieved 8 February 2016. ^ "Fittipaldi EF7 Vision Gran Turismo: F1 champ turns from racing to making". https://www.carmagazine.co.uk. 14 April 2017. Retrieved 7 February 2018. ^ "O Rato de Deus". IstoÉ Independente (in Portuguese). 25 April 2005. Retrieved 24 May 2018. ^ "From motorbikes to McLaren". 14 March 2013. Retrieved 7 February 2018. ^ "Emerson Fittipaldi". 8w.forix.com. Retrieved 28 February 2006. ^ "Emerson Fittipaldi". Edmonton Journal. 9 October 2012. Retrieved 7 February 2018. ^ "Fittipaldi Wins Indy 500 After Collision With Unser". The New York Times. 29 May 1989. Retrieved 7 February 2018. ^ "That's entertainment?". Motor Sport. 1 July 1993. Retrieved 7 February 2018. ^ "Four days to the 100th Indianapolis 500: Emerson Fittipaldi and the Orange Juice". USA Today. 25 May 2016. Retrieved 7 February 2018. ^ "Auto Racing Notebook". UPI Archives. 3 June 1993. Retrieved 7 February 2018. ^ "Lewis Hamilton is a great example for the other F1 drivers, says Emerson Fittipaldi". The Guardian. 30 October 2016. Retrieved 7 February 2018. ^ "1994 Indianapolis 500: an all-in gamble pays off". 31 January 2014. Retrieved 7 February 2018. ^ "Emerson Fittipaldi returns to CART as owner with Fittipaldi-Dingman Racing team". Autoweek. 10 February 2003. Retrieved 7 February 2018. ^ "Mansell wins SA Grand Prix Masters". Mail & Guardian. 14 November 2005. Retrieved 7 February 2018. ^ "Emerson Fittipaldi vai correr na GT3 Brasil". globo.com. Retrieved 30 July 2008. ^ "Emerson Fittipaldi to Become Chairman of Motorsport.com, a Comprehensive Online Destination for the Motorsports World". The New York Times. 16 August 2011. Retrieved 24 August 2011. ^ "Nine new inductees to join the Motorsports Hall of Fame of America". Autoweek. 28 January 2001. Retrieved 7 February 2018. Ludvigsen, Karl (2002). Emerson Fittipaldi Heart of a Racer. Osceola: Motorbooks International. ISBN 1-85960-837-X.